The Everton football club faces tough competition on the pitch, around the UK and across the world for fan loyalty which is why the launch of a new and free integrated website complete with an innovative reward program is sure to score with fans both domestically and internationally. The Sports Techie community blog discussed the news about Loyalty Rewarded technology and their partnership with Everton FC and another EPL team earlier this year. This digital sports technology platform aims to increase quantifiable engagement amongst fans, the EPL club, and their global, regional and local partners. UEFA Euro 2016, Copa America 100, and the thousands of professional FIFA teams as well as amateur leagues and organizations worldwide take note of this sports tech inspired fan marketing program. 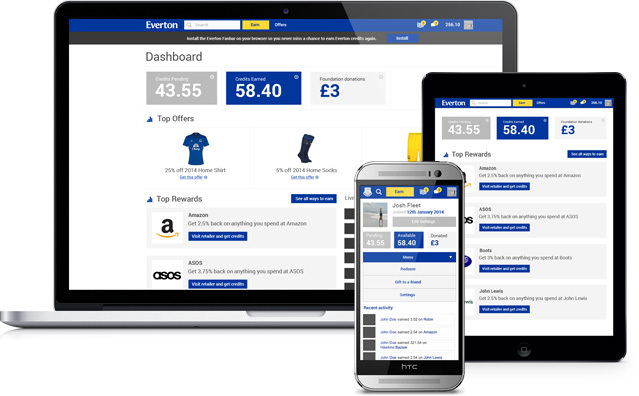 The Everton Rewards App is the smart, simple and secure way to earn discounts on Everton products just for shopping online as many do already. 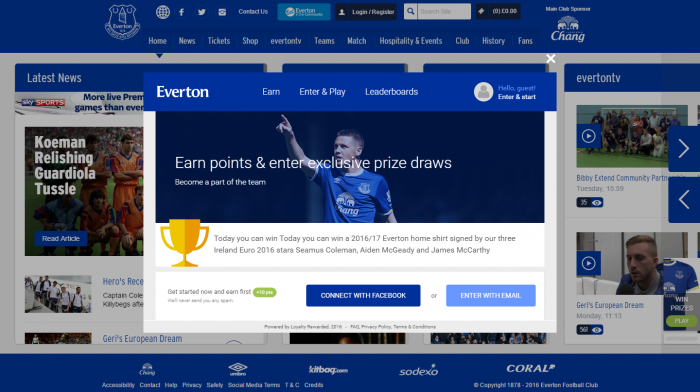 Everton’s club browser app won the ‘Most Innovative use of Technology’ acknowledgment at the 2015 Football (Soccer) Business Awards so it is not surprising they are embracing the rather seamless integration into the official Everton website allowing the BPL club and its proactive partners the ability to offer fans engaging content and fun prizes. Information about user preferences can be data-mined to deliver more business intelligent digital campaigns. Each campaign offers the chance to integrate, target and deliver cost-effective results via enhanced digital marketing initiatives. “Continuing to evolve our digital platforms – giving fans ever more immersive and engaging online content – is our top priority. This latest solution gives supporters the opportunity to benefit from exciting offers and prizes – a compelling combination that fits with our digital strategy,” said Scott McLeod, Everton’s Head of Content. Fans that visit the Everton web site in order to view content, play interactive games and download apps earn reward points redeemable in the Everton online retail store while entering contests with prize draws. Consumers can easily earn cash when purchasing goods online at more than 1,000 retailers, a percentage of which is donated to the club’s charity, Everton in the Community. Loyalty Rewarded postures between a club, its sponsors and its fans, bringing measurable value and engagement into the three-way relationship when a fan is on the club website, a sponsor’s site, or more generally browsing online. Loyalty Rewarded integrates targeted gamification into a club’s site or its sponsor’s site – with very little additional technical requirement – to deliver value to the sponsor’s ad buying through both search and display, and enriching its CRM via e-mail and social communications. Clubs can, as a result, drive greater value from existing sponsor relationships and improve their offer to new sponsors. Loyalty Rewarded also helps clubs drive ticket sales, increase merchandise sales and raise funds for their community programmes through improved fan engagement. Loyalty Rewarded is part of the Data Gains group, which engages brands with their partners and audiences through proprietary cross-platform browsers. It has a number of partnerships in sport, including with English football clubs Manchester City, Everton and Queens Park Rangers; online retailer Fanatics; and horse racing data provider SIS. If you are interested, get started at the Everton website. Everton Fans Loyalty Rewarded With Unique Premier League Website Program – SportsTechie blog. Sports Techie, creating sticky and sharable Premier League content for fans is the name of the modern football game because internet enabled fans on digital devices, smart televisions and via OTT want to get their info directly from the source, in this case from the Everton FC browser app. By doing so, loyal and new fans alike will not only stick around the site checking back daily to see the latest news but they also want to be rewarded for their digital loyalty that drives up club’s website uniques and click-through metrics resulting in satisfied partnerships. Free swag for clicking on links, playing games and participating in polls makes fans happy which is what Loyalty Rewarded technology does for their sports and other business clients. At the same time fans earn rewards Loyalty Rewarded cash, they can donate to a charity of choice. This rewards program creates a true online community with engaged fans, fulfilled sponsors and happy organizations because that is what truly makes the viral football world go round. I am half-Polish, so go Poland versus Portugal in the first Euro 2016 tournament quarterfinals knockout stage match in France on Thursday live broadcast here in the US on ESPN and the Watch ESPN app.